I sat down with the wonderful Michael Beinhorn to talk about his involvement with perhaps thee most iconic rock song of the ’90s. Everything from the drum sounds, guitar sounds, vocals, and songwriting is unbelievable! The track, of course, is “Black Hole Sun” by Soundgarden, which Michael produced and engineered. Throughout his career, Michael has worked with artists like Herbie Hancock, The Violent Femmes, The Red Hot Chili Peppers, Soul Asylum, Hole, Ozzy Osbourne, Courtney Love, Marilyn Manson, Social Distortion, Korn, Golden Palominos, and Mew. The albums he’s been involved with have a combined worldwide sales of more than 45 million! He is also one of a select few producers to have two albums debut in Billboard’s Top Ten in the same week: Marilyn Manson’s Mechanical Animals (#1) and Hole’s Celebrity Skin (#9). This achievement earned him a 1998 GRAMMY nomination for Producer of the Year. Having the chance to meet with Michael and break down one of the most recognized rock songs ever made was nothing short of incredible. “Black Hole Sun” is the third single off Soundgarden’s 1994 juggernaut, Superunknown. The seminal Superunknown was Soundgarden’s breakout record and a tremendous commercial success. It debuted at #1 on the charts and closed the year at 2x Platinum, also earning a GRAMMY nomination for Best Rock Album in 1995. Since its release it’s gone an amazing 12x Platinum and remains one of the best alternative rock/grunge albums ever made. “Black Hole Sun” is the band’s most well known song and remains so to this day. After its release it spent a total of seven weeks at #1 on the Billboard Mainstream Rock Tracks chart. Even after peaking at #2 on the Modern Rock Tracks chart, “Black Hole Sun” still finished as the #1 song of 1994 for that chart. Frontman Chris Cornell wrote the song in about 15 minutes. “I wrote it in my head driving home from Bear Creek Studio in Woodinville, a 35-40 minute drive from Seattle. It sparked from something a news anchor said on TV and I heard wrong. I heard ‘blah blah blah black hole sun blah blah blah’. I thought that would make an amazing song title, but what would it sound like? It all came together, pretty much the whole arrangement including the guitar solo that’s played beneath the riff. After the initial spark of inspiration, Cornell sat down with a Gretsch guitar through a Leslie speaker cabinet. The Leslie gave the song a “Beatlesque” and distinctive sound. Cornell wrote the song despite “thinking the band wouldn’t like it,” and it ended up becoming one of their most famous tracks! “Black Hole Sun” was recorded at Bad Animals Studio X in Seattle. The studio was owned by the band Heart at the time, who were out on tour. The Superunknown sessions were the first time the studio had been rented out to clients. Studio X was a separate facility which Bad Animals had expanded to include at the time. Studio X split from Bad Animals in 1997, but its legacy had already been cemented under the Bad Animals umbrella. When Studio X was a part of the facility bands like R.E.M., Johnny Cash, Nirvana, Heart, Danny Elfman, and of course Soundgarden all frequented the spot. Michael initially had some misgivings about the studio itself, but after he heard the drum sound he could get, he was sold! The combination of a phenomenal drummer in Matt Cameron and the room at Bad Animals gave the drums their distinct quality. Remarkably, the unmixed stems don’t differ much from the finished mix, which is a testament to Michael’s skill! Beinhorn was heavily influenced by electronic music while making the record. The sense of hyperreality you can get from an electronic song full of synths and samples shaped how Michael approached the sounds on “Black Hole Sun” and Superunknown. With electronic music, you have extreme control over every mix element and are able to manipulate sounds the way you want. Michael approached Soundgarden with these principles in mind. While it seems counterintuitive to the rock aesthetic of a bunch of guys jamming in a room live, it’s this departure from a traditional rock approach that made Superunknown what it was! Bringing out the tiny details, like the rattling of a snare drum, was a goal for Michael while producing the record. 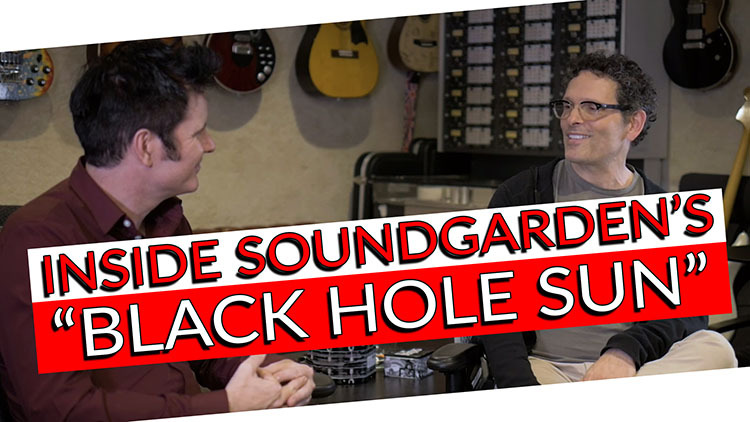 This approach seemed to work out, with “Black Hole Sun”/Superunknown being one of the most iconic pieces of work to come out of the rock/grunge era of the ’90s.